Blueberries are becoming increasingly popular due to their delicious and healthy fruit. Among other things, they are high in antioxidants, have anti-aging activity, promote healthy urinary tracts, improve vision and help fight heart disease. With realtive ease when compared to growing other types of fruit-bearing plants, blueberries can be produced by home gardeners throughout the South. When it comes to selecting blueberries for the southern home garden, the native rabbiteye varieties are by far the best and easiest to grow. There are the southern highbush types but these are primarily commercially grown in the Deep South, and are more suceptible to attack by deer and birds due to their earlier ripening season. Therefore, these can be less desirable choices for the home gardener, although there are newer varieties to try if one is interested. In the end, just make sure and purchase the type of blueberry plants that are most suitable to grow in your area. For gardeners in the North, and mountainous regions in the South, the northern highbush varieties are the choice. One of the advantages of growing blueberries in the home garden is they seldom require spraying for insects or diseases. Depending on the size plants you purchase and install, under good management, blueberry bushes will produce some fruit from the first to third season on after planting. By the sixth year they can yield as much as 2 gallons per plant. The yield will continue to increase for several years as the plants get larger if given good care. One of the most important things to remember about starting rabbiteye blueberries is to plant more than one variety for cross-pollination to promote adequate fruit set. Also, choosing varieties from the different ripening categories provides a broad harvest season. 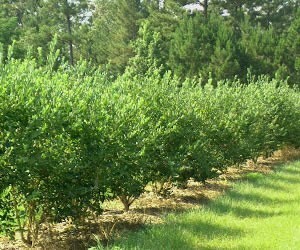 Plant blueberries in groupings or as a hedge as seen in the picture above. There are lots of Blueberry varieties to choose from - each offering fruit with its own, truly unique attributes. Among these are: size, color, flavor, ripening time, required chilling hours, companion pollinators, and more. Why not plant an assortment of early, mid and late season varieties, and extend your blueberry harvest season? With just a little homework, you can select the perfect blueberry varieties for your garden. Climax, Premier, and Vernon may flower too early for growing in the mountain regions, resulting in frequent spring frost/freeze damage. 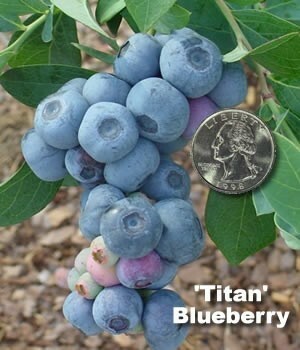 Titan is a very new variety (released in 2011) and may or may not be readily available in your area. However, it is the largest fruited rabbiteye variety that has been developed to date. Vernon also has large berries. Alapaha and Ochlockonee have medium sized berries with good eating quality and less pronounced seeds than varieties such as Austin and Brightwell. If your garden center does not carry a desired variety try finding the one's you want online.